Anti-icing equipment is designed to prevent the formation of ice, while deicing equipment is designed to remove ice once it has formed. These systems protect the leading edge of wing and tail surfaces, pitot and static port openings, fuel tank vents, stall warning devices, windshields, and propeller blades. Ice detection lighting may also be installed on some aircraft to determine the extent of structural icing during night flights. 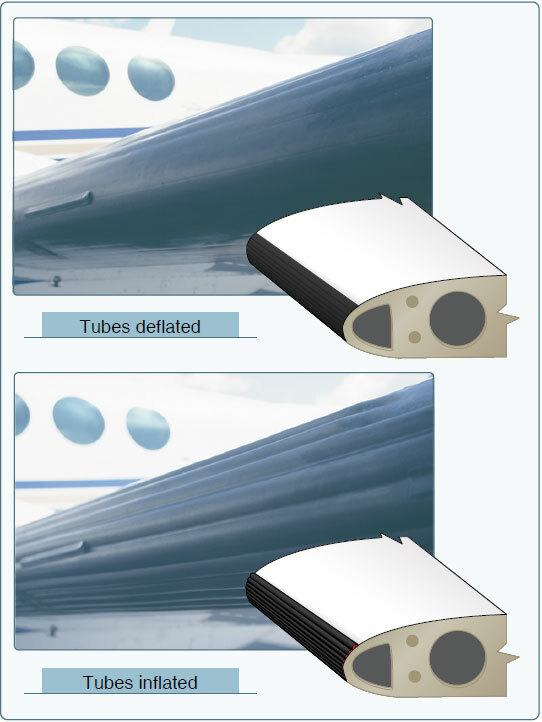 Most light aircraft have only a heated pitot tube and are not certified for flight in icing. These light aircraft have limited cross-country capability in the cooler climates during late fall, winter, and early spring. Noncertificated aircraft must exit icing conditions immediately. Refer to the AFM/POH for details. Figure 7-48. Deicing boots on the leading edge of the wing. In the past, it was believed that if the boots were cycled too soon after encountering ice, the ice layer would expand instead of breaking off, resulting in a condition referred to as ice “bridging.” Consequently, subsequent deice boot cycles would be ineffective at removing the ice buildup. Although some residual ice may remain after a boot cycle, “bridging” does not occur with any modern boots. Pilots can cycle the boots as soon as an ice accumulation is observed. 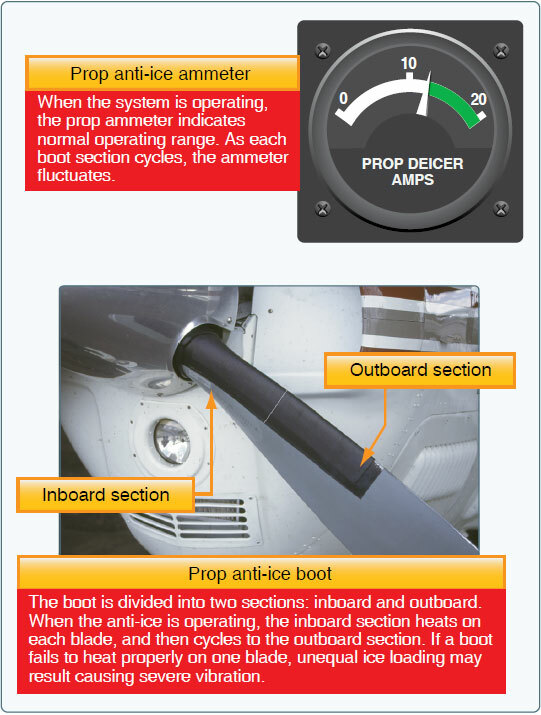 Consult the AFM/POH for information on the operation of deice boots on an aircraft. Another type of leading edge protection is the thermal anti-ice system. 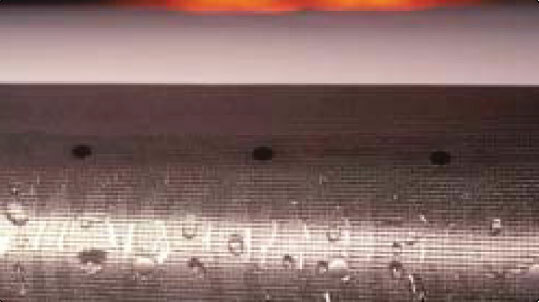 Heat provides one of the most effective methods for preventing ice accumulation on an airfoil. High performance turbine aircraft often direct hot air from the compressor section of the engine to the leading edge surfaces. The hot air heats the leading edge surfaces sufficiently to prevent the formation of ice. A newer type of thermal anti-ice system referred to as ThermaWing uses electrically heated graphite foil laminate applied to the leading edge of the wing and horizontal stabilizer. ThermaWing systems typically have two zones of heat application. One zone on the leading edge receives continuous heat; the second zone further aft receives heat in cycles to dislodge the ice allowing aerodynamic forces to remove it. Thermal anti-ice systems should be activated prior to entering icing conditions. Figure 7-49. TKS weeping wing anti-ice/deicing system. There are two main types of windscreen anti-ice systems. The first system directs a flow of alcohol to the windscreen. If used early enough, the alcohol prevents ice from building up on the windscreen. The rate of alcohol flow can be controlled by a dial in the flight deck according to procedures recommended by the aircraft manufacturer. Another effective method of anti-icing equipment is the electric heating method. Small wires or other conductive material is imbedded in the windscreen. The heater can be turned on by a switch in the flight deck, causing an electrical current to be passed across the shield through the wires to provide sufficient heat to prevent the formation of ice on the windscreen. The heated windscreen should only be used during flight. Do not leave it on during ground operations, as it can overheat and cause damage to the windscreen. Warning: the electrical current can cause compass deviation errors by as much as 40°. Figure 7-50. Prop ammeter and anti-ice boots. Pitot and static ports, fuel vents, stall-warning sensors, and other optional equipment may be heated by electrical elements. Operational checks of the electrically heated systems are to be checked in accordance with the AFM /POH. Operation of aircraft anti-icing and deicing systems should be checked prior to encountering icing conditions. Encounters with structural ice require immediate action. Anti-icing and deicing equipment are not intended to sustain long-term flight in icing conditions.